Clearly looking to capitalize on March Madness, the NCAA Tournament and the Final Four, without actually having to reference any of those copyrighted titles, Sonic Drive-In introduced Wacky Madness toys in their Wacky Pack Kids Meal for March 2016. 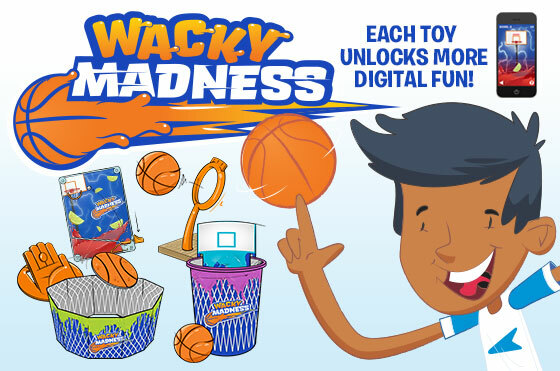 There are four toys in the set, including "Back Seat Basketball," "Free Throw Flipper," "Half-Court Shooter" and "Slam Dunk." On a playground, kids would describe these as a pinball game, a hand-flipper, a catapult and a miniature trashcan, respectively. If one is looking to clear shelf space to prominently display the Wacky Madness toys, then the trashcan will bring about euphoric feelings that a pinball game can only aspire to. It includes a backboard and basketball and can simultaneously inspire youngerts with creative dunk ideas and help develop the motor skills needed to put ice cubes in a glass. If one wants to imagine playing one-on-one with Thing from the Addams Family after Thing has bathed in Cheetos, then the hand-flipper is the boulevard to satisfaction. It comes with three basketballs that resemble poker chips, along with a paper net that needs to be set up very close, because Thing does not have a deep shooting range. Sonic calls their catapult a "Half-Court Shooter." Considering half of a basketball court is 47 feet long, I've yet to take the toy into a gym to ascertain whether Sonic has committed perjury or not. The pinball game may not be capable of diverting one's attention from television or the internet, but Sonic advertises the game as entertainment for the back seat, proving their marketing team is comprised of geniuses. I cannot understate how much this game would have improved the five minutes I spent playing Travel Bingo or handheld Yahtzee!, before becoming overly nauseous because I was attempting to play a game while riding in a car. Clearly, this set includes a toy for every demographic. Considering that neither Rick Pitino or Larry Brown will be coaching in the NCAA Tournament this season, Sonic missed an opportunity to film what could have been one of the greatest commercials ever. Picture this: the two coaches sitting in a car, ordering two kids meals, Coach Brown commenting how he really likes dunking his tots in ketchup, while Pitino holds up the "Slam Dunk" toy and says, "You know, you could fill this with ketchup and dunk your tots in there." I'm not certain what the slogan "This is how you Sonic" means, but if it implies Hall of Fame coaches dunking potatoes in a toy hoop, then I wholeheartedly support it.